Leningrad Symhony Orchestra. Conductor Kurt Zanderling. USSR State Radio Orchestra. Conductor Natan Rakhlin. 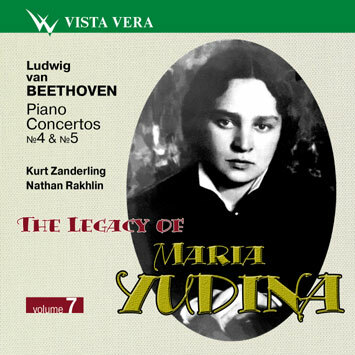 This CD includes Yudina's recordings of Beethoven's Piano concertos No 4 and No 5. It is a miracle that these unique archive recordings made in 1947 and 1950 are still extant. No 5 is released for the first time ever while No 4 was issued on a gramophone record long ago. So the significance of these Yudina's recordings may not be underestimated for musicians and philharmonics. Besides, we may hear here two outstanding conductors of the 20th century who were partners and friends of Yudina, Kurt Zanderling and Natan Rakhlin. However the main reason why these recordings are unique is that these are really two masterpieces of Yudina's artistic performance. When listening to her interpretation of No 4 one can forget that it is performed by a musician of the 20th century. Beethoven's great music sounds here like coming from under the hands of the author himself, in a very clear and unaffected way. It is permeated with "silence clear like clean water in a crystal cup" (Yudina about Florensky). It reflects the state of soul that corresponds to the harmony of the concerto. Beethoven's notes in all three movements tell us exactly this: dolce, molto cantabile, molto espressivo - the composer writes and suggests to play p, pp. Gentle and delicate sound of piano fascinates from the very first chords. The orchestra plays the same theme even more gently and with exalted power. Maria Veniaminovna Yudina found in Kurt Zanderling a like-minded musician and a tactful partner. We can hear here such a co-ordination of intentions and the attitude to the whole composition that makes the performers imperceptible. It's the absolute spirit that reigns here. But then in cadenzas written by Brahms Yudina reveals herself in full measure as a personality and an interpreter. It's a true improvisation where Yudina, following the romantic intonations by Brahms, introduces new substance into familiar themes with a stylistic impeccability. In the first movement there are no typical Beethoven contrasts and dramatic collisions. But one can hear these in cadenzas that as performed by Yudina acquire a truly symphonic scale and become culmination of the movement. Second movement represents a mournful dialogue of the piano and orchestra. The strings sound sternly but not menacingly. Quiet (p, pp) and singing (molto cantabile) piano remarks are full of sorrow, resignation and light. The voices of two suffering artists, Beethoven and Yudina, flow together sounding like revelation. Maria Veniaminovna plays Finale with amazing gracefulness and underlines a dancing character of the main theme. There are great many bewitching crystal soundings in high register and rich mellow basses in pastoral episodes. On the whole No 4 as performed by Yudina staggers by an extraordinary combination of two principles. On the one hand, it's lofty clear lyrics, lovely tunes that sour in the clouds and seem not to be restricted by any limits of rhythm or measure or form. On the other hand, there is an instant change over to firm measured passages where indomitable energy pulsates and everything is yielded to iron rhythmical will. The same combination of iron will and spontaneity and incomparable lyricism fascinates in Yudina's interpretation of Concerto No 5. "Already with the first E flat major chords Yudina raised the curtain behind which a panorama of a truly Hellenic beauty was opened to our eyes, - says Gennady Rozhdestvensky who once accompanied Yudina in performing the Concerto. - Indeed it's a deep perception of the essence of Beethoven's music and its exceptionally modern interpretation, lucidity alongside grandeur, this is what distinguished Maria Veniaminovna's performance". The great art of Maria Veniaminovna Yudina is full of mysteries and enigmas. It would be in vain to try to solve them. Let's just ponder over them and always remember that "our approach towards understanding of a musical composition is infinite" (Yudina).